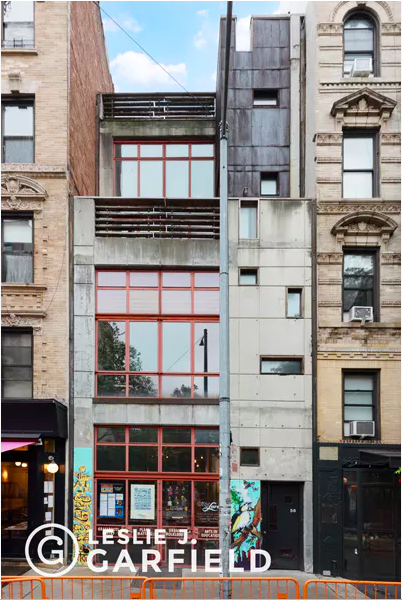 The three-unit, five-story property at 56 E. First St. between First Avenue and Second Avenue has arrived on the sales market. This 5-story, approximately 6,090 sq. ft. building contains a commercial space on the ground level (with spacious cellar) that could be converted to residential, a duplex apartment with outdoor space and a sprawling triplex with 20' ceilings, terrace, and roof deck. There is additional FAR that could be realized by building up and/or utilizing some of the unused internal cubic feet. In its current configuration, the property provides an ideal live-plus-income or investment opportunity. It could also be converted to a grand single-family home or used for institutions. According to Jennifer Gould Keil, who first reported on this at the Post, the owner is Eric Anderson, a co-founder of Prune right next door. This story from the archives at the Times has more on the building, constructed in 2004, and Anderson. The ground floor here was the home of the Lower Eastside Girls Club until their move to Avenue D. The space is currently the City Lore Gallery.